I now understand how Wile E. Coyote feels, always chasing the Road Runner but never catching him. I've spent the past few days trying to photograph the Despicablimp, the airship cruising the country to promote Despicable Me 2 (yep, the Minions--which, as anyone who knows me or has visited my Facebook page can tell you, is one of the truly great joys of my life!). The Despicablimp is painted to look like a gigantic Minion, so of course I want to photograph it! The Despicablimp arrived in the St. Louis area on Tuesday evening. I was on the lookout for it, having received its estimated arrival time from the pilots via Twitter. It could have been a good shot, had I not been positioned just a bit too far south! I had a spot on a hill overlooking the interstate, my camera set for zoom. A few clouds aside, it was a bright, sunny afternoon. I had everything I needed for a good photo. Except my subject. Wednesday morning brought renewed hope. Tweet from the Despicablimp crew: they would be in the air again, "all over town." Well, not exactly all over town. Not in my neighborhood, anyway. I find myself wondering if this might be due to the fact that we're very near the Jefferson County line. For the unenlightened, Jefferson County was once the meth lab capital of the country with 2075 labs counted. It now has only 1825 (if you don't count those mobile meth labs in soda bottles) and has lost the top spot to Tulsa, Oklahoma. But that's still a lot of meth labs in Jefferson County, and a lot of druggies who might mistake the Despicablimp for a UFO and start shooting at it! But I digress. Back to my own pursuit of the glorious Despicablimp. Collin and I went out as soon as it was airborne again, armed with our smartphones/cameras. We had lunch at McDonalds (which, by the way, did a DM2 promo--we ate a lot of Happy Meals to collect two complete sets of Minion toys!). We found a booth that gave us clear views in three different directions--just in case. Once again, disappointment. The Despicablimp had headed west from its local base at the Regional Airport. It was flying over Forest Park, the Central West End, Shrewsbury--my old neighborhood, the same place Collin and I had gotten a great view of the Titanic blimp one night fifteen years ago. This is what we get for moving. It also flew over St. Louis Childrens Hospital. I hope a lot of kids being treated there got to see it. It would have made their day! 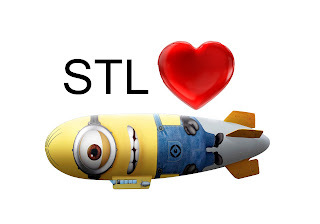 I was up early this morning, hoping to hear the chirping sound of my Twitter app, letting me know the Despicablimp would be heading in our direction today. Nope. When the tweet came, it was to let everyone know the crew would be taking the day off and the blimp would be on the ground at Alton all day. Well, hey--everybody needs a day off. I haven't lost hope. As Scarlett O'Hara once said, tomorrow is another day. I might yet get at least one Despicablimp photo--and if I do, you'll see it here (and at my Wordpress blog) first. And to my photoblogger friends--I don't know how you do it! Even with an Acme anvil on my head, Shelly? We shall keep our fingers crossed! William--Collin and I talked about going up to Regional Airport to see it, but I have so much trouble getting around these days, I'd need Dr. Nefario's scooter! 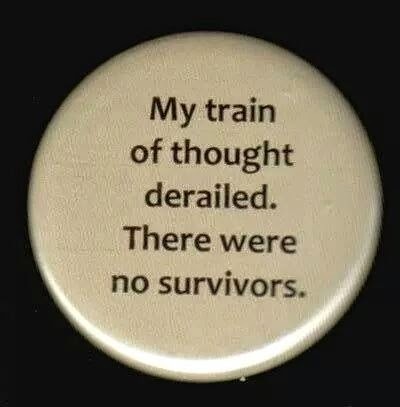 :-D Thank you for the chuckle, Norma!! You're most welcome, Lulu--and welcome back! Collin has the coolest mom. Maybe you need to take a road trip to Alton and catch them sleeping!! I would have loved to go up there--but I can't drive because I have seizures, and it would be three hours by bus. I must write about my encounters with the Oscar Mayer Hot Dogmobile. I hope you get to see it tomorrow ! The Wienermobile? I thought Anthony Weiner bought that! Can't wait to see your pix! Get the Despicablimp to South County! 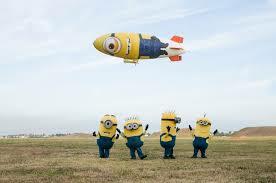 Tweet them at @Despicablimp ASAP!!!! It took, but two is always better than one! Aw, too bad! But there's hope! How fun! I tweeted to ask what kind of bait to use to lure a Despicablimp within camera range. I have this mental image of a mountain of bananas! I'm hoping when the pilots return to begin the flight to Chicago, they'll make one more pass over the city--and in my direction! In this case, Grace, only if it happens to pass over St. Louis en route to another destination!